In an ideal world there would be charming neighborhoods full of houses so perfect you wouldn't even need to check the water faucets, much less hire a highly qualified home inspector. You could just comfortably make an offer on the house you liked the best and be done with it. Sweet. OK, welcome back to reality! In the real world, every house needs an inspection before you buy and almost every inspection report is going to come back with at least one very black mark. That means you’re probably going to end up agonizing over the eternal home buyer question: To bolt or not to bolt? Fish or cut bait? Go for the deal or run for the hills? The answer depends a lot on your tolerance level, but there are a few issues that real estate agents and home inspectors agree are total deal breakers. If you spot these, proceed with extreme caution. 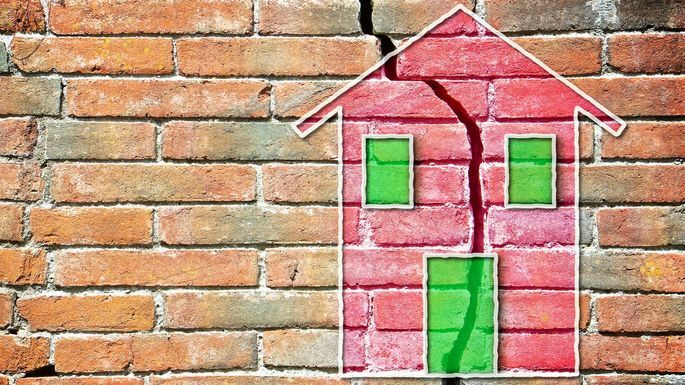 Foundation issues are a huge undertaking to repair, and our experts agree it tops the list of home-buying deal breakers—especially if you’re a first-time buyer without the extensive funds needed for a lengthy and costly repair. The problem is, some foundation issues might be minor. The only way to tell is by hiring a licensed structural engineer to get to the root of the problem. “It’ll be the best $500 you ever spent,” Sisson says. Aluminum wiring, which was popular during the Vietnam War era, isn’t terribly common these days. But if your potential home has it, it could mean big trouble. If the house does have aluminum wiring, an electrician can add copper near the outlets—but that's akin to putting a Band-Aid on a bullet wound. Odds are, you’ll need to have all the wiring replaced, and that can cost thousands of dollars. Before electrical heating came along, some homes had oil tanks buried in the backyard to funnel propane to the house during winter. Sound scary? It is! And there’s more: Those tanks might still be under the ground, just waiting to wreak havoc. “These are environmental time bombs," Sisson says. "If there is any evidence of leaking, the costs to remove a tank can easily exceed $10,000." Buried oil tanks are more common in the Northeast, where winters were harsher, but they can be found anywhere—and finding them can be tricky. If they’re active, you'll see two pipes coming up from the ground. If they were shut off, there won’t be any outward evidence. These pipes had their heyday as a cheap alternative to copper in the '80s, but it didn’t last long. “They were found to degrade due to the chlorine in municipal water supplies, and would spontaneously leak and cause terrible flooding,” Sisson says. So all smart homeowners got rid of those pesky pipes, right? Nope—if the pipes haven’t leaked, homeowners tend not to be so quick to replace them. Sisson sees it all the time. And while the current owners might have skirted by without waking up to an indoor swimming pool, you might not be so lucky. “The damage is from the inside out, so it's not visible until it fails and starts spewing water all over your basement,” Sisson says. The only fix? Total pipe replacement to the tune of $10,000 and up. If you’re buying an older home, odds are someone did some upgrading before you came along. That's usually a good thing (hello, granite countertops! ), but it can be a very bad thing if the homeowner in charge had a DIY streak and a problem with authority. Most upgrades require a permit from the local county or city. If the homeowner skirted the permit step and something goes wrong later (say, a fire from shoddy wiring or a flood from a busted pipe), you might run afoul of your homeowners insurance company. “The insurance company will find out the work was not permitted and will most likely deny the claim and cancel the policy, leaving the homeowner on the hook for all the damages,” Sisson says. Most of us are worried about mold. Very, very worried. But mold might not be an automatic deal breaker. That dark stuff you see around the grout lines in your bathtub? Yes, that's mold. But there's no reason to go running scared. If you do encounter the nasty stuff, the best thing to do is have it identified by a qualified inspector. Many mold problems aren’t reason enough to not buy a home, but then again, some are. Have the experts tell you what category this house falls into. No question: Bug infestations are intensely gross. No one is thrilled to see roaches running around their potential new kitchen, but very few bug problems are a big deal—with one notable exception: termites. “They can literally eat your home,” Jarvis says. If the problem isn’t termites, plan on hiring a good exterminator before you move in and possibly having to deal with a few follow-up treatments. Inspections cost money, and no one wants to be out the cash and a new house. But do it anyway—even on brand-new builds. You might spend a few hundred upfront, but you could save yourself thousands down the line.